But my, what a year it’s been for births so far! Not only have our friends and family members been filling up our Facebook news feeds with photos of their cute newborn bubs, but we’ve also been bombarded with the sensational news of the world’s most famous new baby – Little Princess Charlotte of Cambridge! And the increase in population doesn’t stop there. We have an entire six months more of cute new babies to welcome into the world. But prior to the celebration of someone’s birth, it’s often important to celebrate the news that a couple is about to become parents to a new bundle of pooey nappies. Um, I mean, joy. Especially if this news is exciting and much anticipated by all. We celebrate birthdays, hens and bucks parties, wedding days and all sorts of holidays in between. 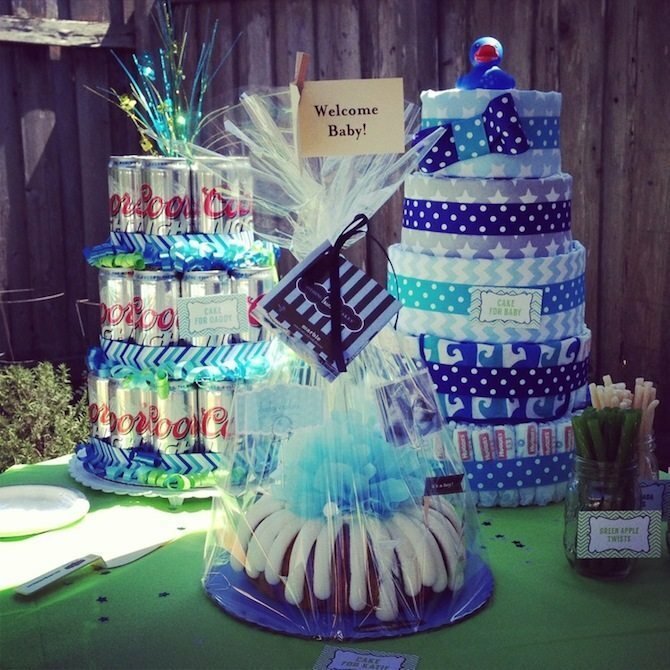 Don’t miss out on celebrating a pregnancy with a baby shower! There is all sorts of cuteness involved! I wonder what kind of baby shower Duchess Catherine threw for her new daughter, despite there already being a mass media circus surrounding the news at the time. Perhaps headlines on the front pages of gossip magazines worldwide was enough of a baby shower for the royal family. But we can’t all celebrate in such a high profile fashion. The cost of getting anything printed in the newspaper is far beyond most people’s budget anyway, let alone trying to make your pregnancy a cover story in Women’s Day. And seeing as it’s 2015, we’re all about new, modern and interesting ways to celebrate such a great occasion. 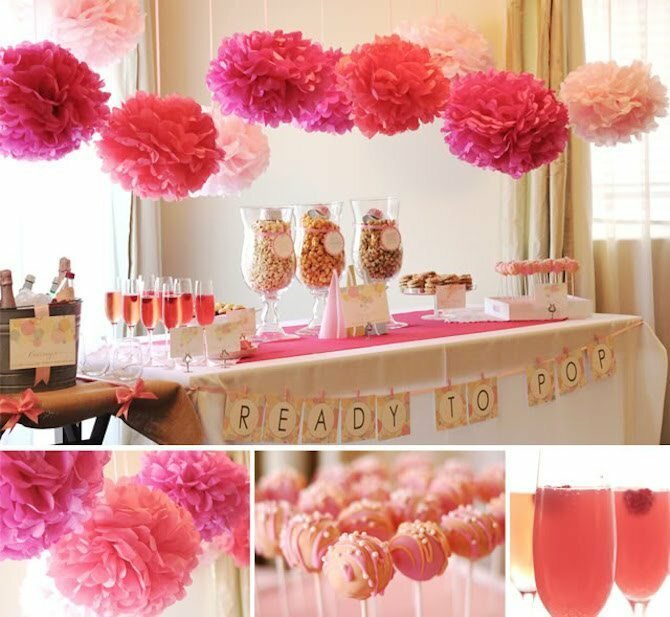 So here are 15 of the hottest baby shower themes for 2015 to excite and inspire! Check out what this creative event planner did for her sister and brother-in-law. She put on a black and white dessert party for everyone, including things like icecream, toppings, milk and cookies. She decided to involve children who were already born and put together an interesting game of letters and readings for all to enjoy, leading up to the revelation of the child’s gender. You can read all about it here. Knock Knock. Who’s there? Who. Who Who? You sound like an owl. And why wouldn’t you want to? Everybody loves an owl these days! Not only are gift shops and fashion outlets highly stocked with owl themed merchandise, it is also a fact of life that kids today love the popular puppet characters Hoot and Hootabelle the owls from TV’s “Giggle and Hoot”. So it makes complete sense to dedicate an entire baby shower to these wise old birds of the night. The Mandatory Mooch has more owl ideas. It is often said that when a woman is about to give birth, she is “ready to pop”. It’s actually quite a POP-ular phrase these days! 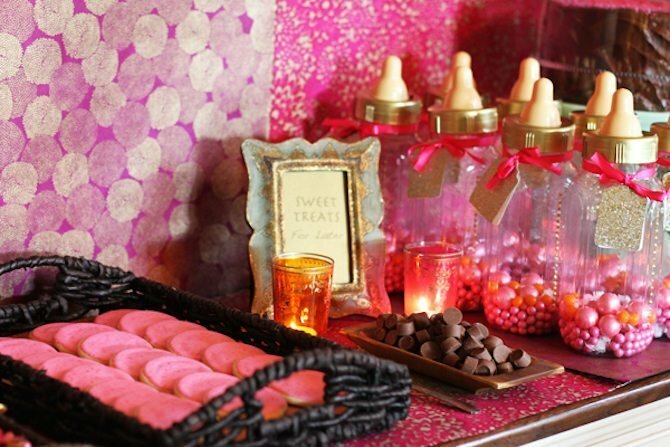 So this bright spark Le Partie Sugar decided that her popcorn-loving friend deserved a popcorn themed baby shower. She even threw in other “pop-related” items like chocolate cake pops and wines with corks to pop! They decorated the place with balloons too, so hopefully when they pop, poor Mum doesn’t get a fright and join them! Twinkle is said twice in the famous nursery rhyme about the star that shines up above the world so high like a diamond in the sky. This mum certainly had two twinkles in her eye when she learned she was carrying twins! A huge party filled with star themed cakes and games was thrown to celebrate. Check out the twinkle at Momtastic. Ladybugs are probably the world’s cutest insects. A timeless design, they’re very popular creatures with manufacturers of gifts, toys and sleepwear. Cute creatures and cute babies go hand in hand. And as this baby will be a “little lady”, it seemed appropriate for The Cake Blog’s Carrie to theme a party around loveable ladybugs. 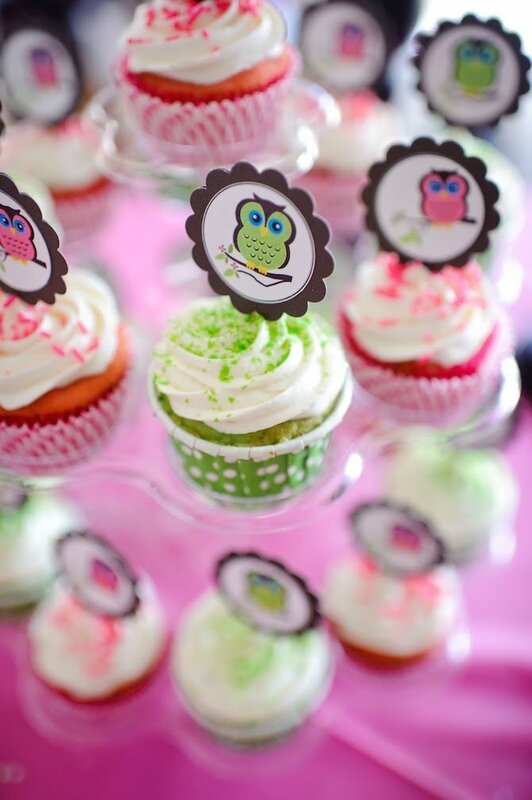 If you already have a child, your second child’s baby shower is called a sprinkle. Not quite a full on shower as the first. Just a sprinkle to show you care. Of course, this doesn’t mean your second born child is second best. This party features sprinkles galore! 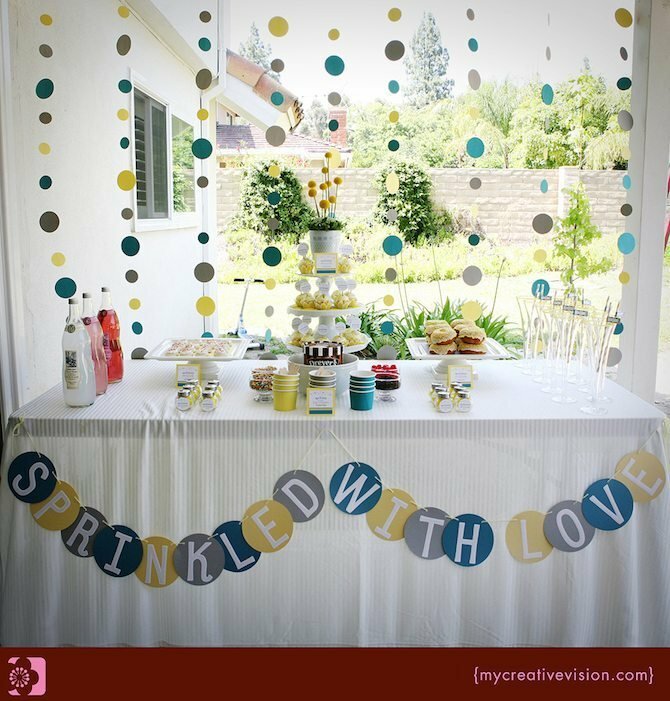 Sparkling lemonade, sprinkle covered cakes and treats, and different sized cutout circles to decorate the event. 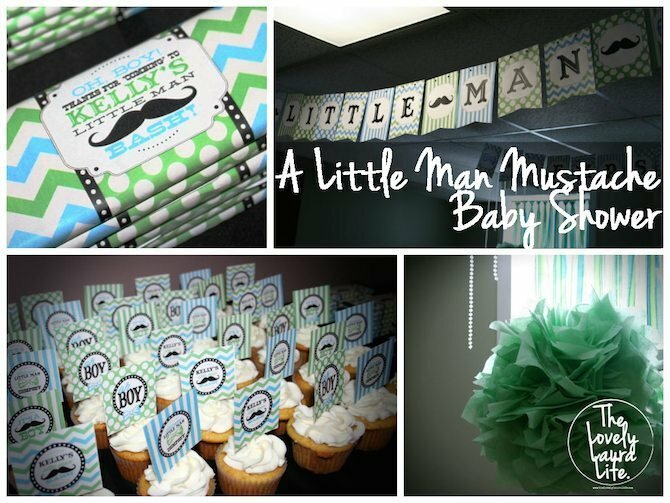 Beards and moustaches are all the rage again lately, so when you’re about to give birth to a boy, why not get in the moment and throw a Moustache Bash baby shower to celebrate the new little man on his way. The Lovely Laura Life blog shows how it’s done. Popular Muppet character Ernie said it best – “Rubber Duckie, you’re the one. You make bath time lots of fun. Rubber Duckie, I’m awfully fond of you”. 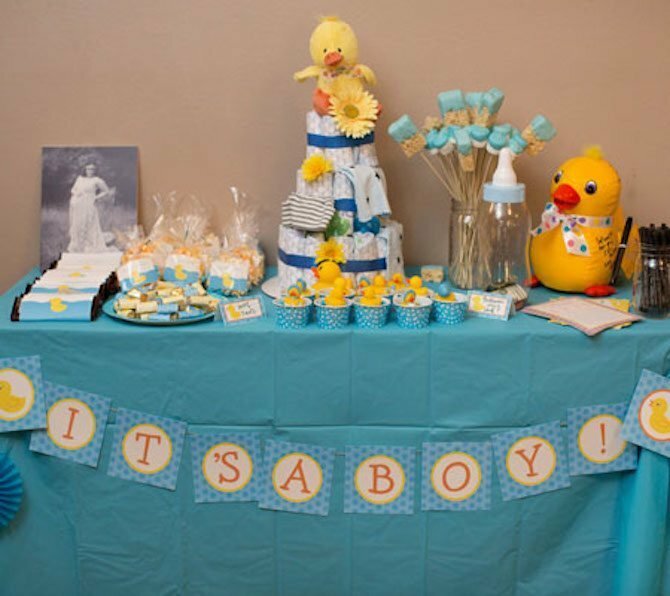 This fun baby shower was entirely themed around cute yellow ducks! Puddings, cakes, decorations and party favours all covered in ducks! What a quacker of an idea from Disney Baby. 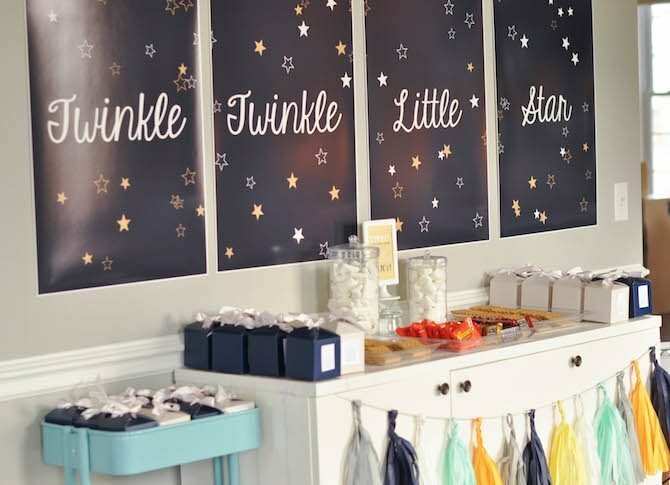 After seeing the decoration of the baby’s bedroom, the Mum-to-be was clearly interested in ocean creatures and under sea adventures, so the organiser of this baby shower decided to throw a whole party based on this theme. Pom poms, flower vases, chalkboards, ribbons and clothes pegs. The vintage theme (or hipster theme, as some like to call it) is all the rage. This Lily Shop party even has those jars with straws in them that all the quaint hipster cafes and bars are serving. Were drinks actually served in jars with straws back in the 1800s? Perhaps not, but people love it! 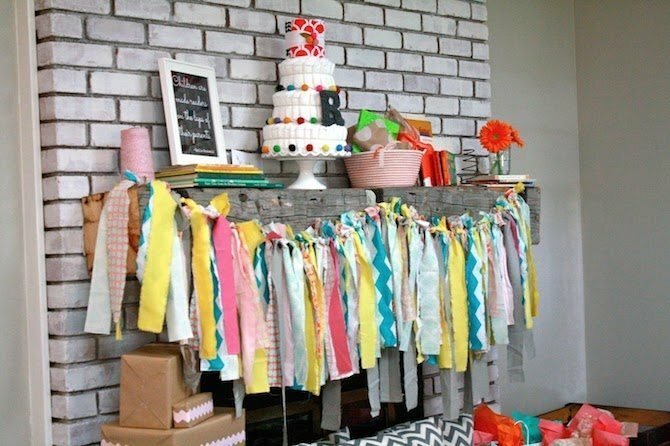 For those who like to read, here’s a fun little baby shower idea based around books. Brightly coloured ones! At Domestic Charm the blogger and her sister-in-law got together decorating books as centrepieces, letters, quotes and book-themed decorations. They’ve also included other quaint things like flowers, tea and stripy straws in bottles. Can you nurture a love of reading from the womb? Worth a shot hey? Why should babies get all the milk? Tempt everyone into a life of milkaholism with a celebration of all things milk. Carrie from The Cake Blog has created baby shower beauty again with black and white cow prints as the main theme. With cheesecake, chocolates and other fun milk-related food and drink items on offer, this looks like it was a really mooooving experience. While baby Princess Charlotte of Cambridge may well be surrounded by the finest of gold due to her royal heritage, there’s no reason why regular baby showers can’t enjoy the Midas touch also. 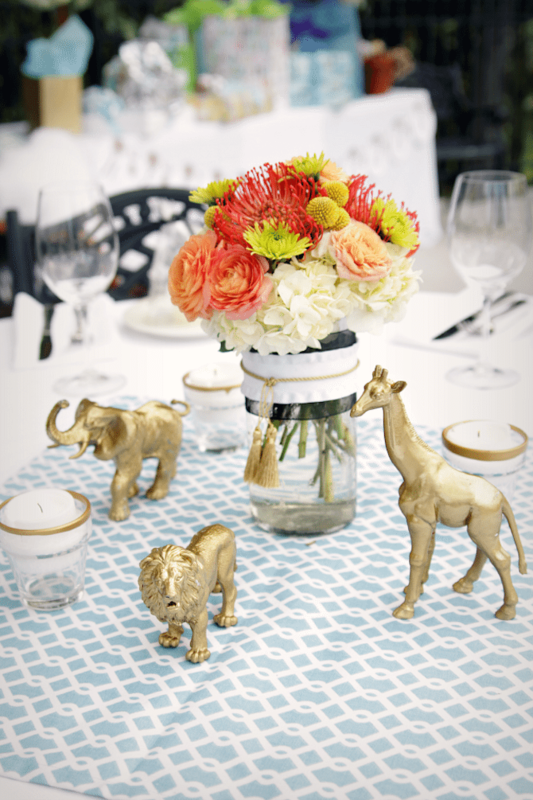 This Decor Fix party is decorated with golden picture frames, golden candle holders and, best of all, golden wild animals. It’s just like a safari through Africa, except the animals are miniature, painted gold and pretend. Like teddy bears and golliwogs, the sock monkey is another old favourite in the world of toys. Did you ever see the film, “Mr. Magorium’s Wonder Emporium” starring Dustin Hoffman? If so, you’ll remember the living sock monkey always reaching out for a hug throughout the film. 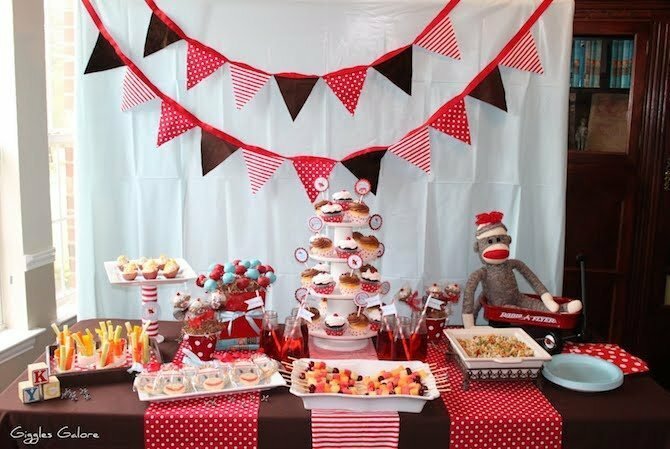 The best about this Giggles Galore party is you can actually hug the sock monkey, and eat all the sock monkey cakes and biscuits while celebrating the fact that you’re going to have boy/girl/twins! The rich colours and designs of Morocco need not wait until you can afford to travel there. You can bring Morocco to your own home, as these six girls did for their dear friend. This very fancy looking baby shower, featured on Lily Shop, included lanterns, cushions, rose petals, an old bird cage and even some Henna designs painted onto everyone’s arms and the mum-to-be’s pregnant stomach! Well, I think it’s time I make myself a new crafty best friend because these celebrations are making me clucky! Any takers out there? 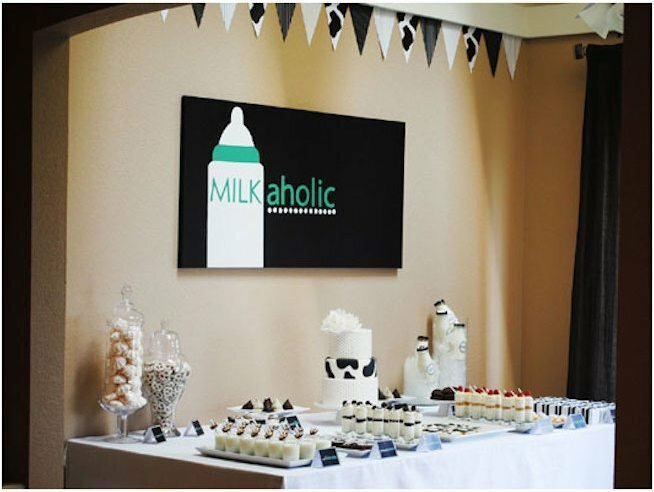 Oh – and before I leave all you milkaholics alone, I can’t recommend highly enough the importance of appointing someone as a designated baby shower photographer. All that exquisite detail and extraordinary fun simply must be captured on camera. When baby arrives, one of these delightful photos will look just gorgeous as part of a new born canvas wall display.